How did we get this book: We both got signed ARCs at BEA. Why did we get this book: We went to the YA Buzz Editor’s panel at BEA and Erin Bow was one of the panelists, when she started talking about her book, we both started foaming at the mouth to get it. About half an hour later, we are walking around the signings session and lo and behold: Plain Kate! Erin Bow! THERE! So we just got in line and got us lovely copies. Ana: I came away from BEA in May with about 100 books in my suitcase and I can honestly say that Plain Kate was my most anticipated read out of the bunch after I saw the author speaking at one of the panels. We often say here at The Book Smugglers’ HQ that sometimes having that much expectation works against a book, as unfair as it is. I think this is at work here, at least in my case: I loved many, many things about Plain Kate: the writing, the setting, the main characters, and it is really, a very good book but ultimately I felt strangely underwhelmed and somewhat disappointed that it wasn’t as good as I hoped. Thea: As Ana says, Plain Kate was a total surprise at BEA. I hadn’t heard of the author nor a peep about the book, but when we heard Erin Bow read a passage aloud, I instantly knew I had to get a copy. And you know what? I walked away from Plain Kate feeling emotionally worn, but immensely satisfied. For me, the book lived up to my expectations, and then some. I loved this book. Ana: What I liked the most about Plain Kate was the atmospheric medieval Russian setting and the evocative, beautiful prose which combined to give the book a distinct flavouring, a feeling that the reader is taking part in one of those old tales. To start with, the story is extremely inviting, welcoming even, as the tale of Plain Kate unfolds. From her relationship with her father, then with the village and its support (or lack) system, from her pride on the fact that she was one of the best wood-carvers that there was even though she was not officially part of a guild; to the increasing fear of witchery and what happens to people who let fear dictate their actions. Had the story followed this pattern and had Kate’s story gradually develop on its own, it would have been awesome, I think. But soon enough, after Kate meets the witch Linay and makes a Faustian deal with him, it becomes clear that Plain Kate is at its core a Revenge story, the Revenge is what moves the plot along but because the Revenge is to be exacted by someone OTHER than Kate it is as though the story suddenly moves its focus and the main character becomes a supporting character of her own story (but more on that further down). I did find the story itself interesting (and I love the idea of how important one’s shadow is) even though not necessarily original but I liked its uncompromising darkness. Although the execution of the plot was not flawless and I counted at least two instances of Extreme Coincidence to move it along. I would say that the first part of the novel was my favourite, then it lags a bit in the middle and it picks a bit again towards the ending which makes for a very uneven read. It also needs to be said that I LOVED the fact that there is no romance in sight, none, zero. It is all about Kate and her friends and enemies and that the ending was a happy as it could be given the circumstances. But writing this I realise that perhaps the one reason I have to LOVE the book is perhaps the wrong reason: I love it for what it is NOT, rather because of what it IS. Thea: I have to disagree, Ana. 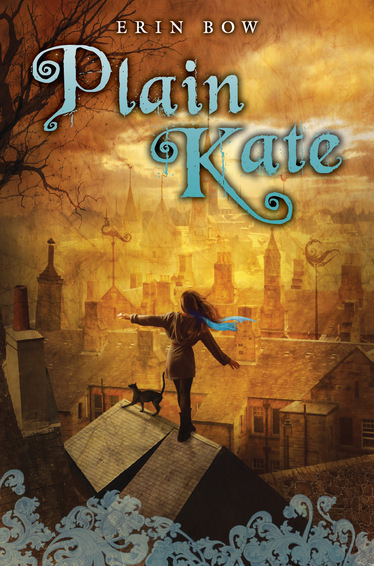 Though the book is titled Plain Kate, and though Kate is clearly the protagonist, I loved that she is an indirect heroine, by someone else’s design rather than of her own choosing. I love that ultimately, Linay chose Kate as his subject, not because of any innate magical ability or because she was born under a certain star when the planets aligned or whatever Chosen One sort of hoopla – rather, Kate is our heroine because of her perceived weakness, and over the course of the book this flourishes into strength. Instead of following Kate on a journey of her own design, Plain Kate takes an ordinary – plain – girl, and gives us her adventure in a game of a much bigger design. From a writing standpoint, Ms. Bow’s prose is smooth and lush – as I remarked to Ana in an email, this book reminded me so of Garth Nix’s Sabriel (and not only because there’s a talking cat). Written in the style of the fantasy novels of my childhood – relying on emotions and almost poetic descriptions as opposed to a focus on action or romance (as seems to be the modern trend), Plain Kate is almost nostalgic. And, as a fan of Tamora Pierce and Garth Nix, Ms. Bow is a bonafide throwback, and I mean this in the best possible way. With regard to setting, I completely agree with Ana – the medieval Eastern European feel to the novel is perhaps not entirely unique, though it is well written and conceived. The brutality of people looking to blame “witches” for their misfortunes, their propensity for hate, the mob mentality, it’s all unflinchingly seen in Plain Kate. At the same time, there is this underlying thread for wanting to belong – for acceptance and love for oneself, which is handled beautifully, I think. As Ana mentions above, Plain Kate does have a revenge story (in fact, it is the impetus for the plot), but I don’t think it’s fair to say that this novel is a revenge book. More than anything, Plain Kate is about acceptance and sacrifice. Ana: On one hand the majority of the characters are complex and never fall into one-dimensional territory. That is especially true with regards to Linay who has compelling characteristic that makes him sympathetic even when he is being heinous. I appreciated the difficult, intricate love-hate relationship he forms with Kate. On the other have I have mixed feeling directed to the protagonist of the novel. She has all the markings of a great character: strength of character, a sense of self-worth, empathy and quiet determination. It is a shame that she is written into a story that increasingly becomes not her own and which makes her more of a “reactive” character than an “active” one as most of the things that happen in the book and which serve to move the story further are events that happen TO Kate rather than out her own volition, even those some of these reactions are actually pretty cool because of who she is. And then there is Taggle, her cat, whom I loved so totally, although I can’t really say why for risk of spoiling it but he is full of heroism and dedication and has an arc of his own which is a very interesting pointing at another consequence of Kate’s Faustian pact with Linay. Thea: I share Ana’s love for Taggle, and her mixed emotions towards Linay (and I would extend that to Behjet, as well); it is the mark of a gifted writer that a reader can loathe a character and yet still feel sympathy and understanding at the same time. Plain Kate’s world is a rough one, and her journeys take her to people that fear her skill at carving, taking her natural talent for witchcraft, and her mismatched colored eyes only exacerbating her position. Each character in this book has surprising depth, with no simple “good” or “bad” cookie-cutter types of heroes or villains. And this, of course, extends to Kate as well. While I completely agree that Kate’s story is more of a “reactive” one, I do think this is part of the appeal of Plain Kate. Plain Kate begins her journey because she is singled out for her weakness – when she isn’t weak at all. Using the lessons of her father, Kate gradually takes hold of her own story, and by the end of the book, she has made her choices (heartbreaking though they may be) and won me over completely. It’s very clever characterization when you think about it, this slide from utterly passive and reactive to aggressively proactive. And a quick note as to the adjective “Plain” prefacing Kate’s name. While it is true that Kate is neither beautiful nor ugly, I personally think that the “Plain” refers to Kate’s simple honesty, or as the Miriam-Webster Dictionary says, “free from artifice.” That is Kate to the letter. Ana: It is the strangest thing: Plain Kate has many elements that should have me truly love this book but I was left cold. I wish I could be more positive but two weeks after reading it, all I can remember is the cat. I did love the prose though and I will be first in line to get Erin Bow’s next book (which sounds awesome). Thea: I loved Plain Kate from beginning to end, and I most certainly will be back for more from author Erin Bow. Absolutely recommended. A long time ago, in a market town by a looping river, there lived an orphan girl called Plain Kate. She was called this because her father had introduced her to the new butcher, saying: “This is my beloved Katerina Svetlana, after her mother who died birthing her and God rest her soul, but I call her just plain Kate.” And the butcher, swinging a cleaver, answered: “That’s right enough, Plain Kate she is, plain as a stick.” A man who treasured humor, especially his own, the butcher repeated this to everyone. After that, she was called Plain Kate. But her father called her Kate My Star. Plain Kate’s father Poitr was a woodcarver. He gave Kate a carving knife before most children might be given a spoon. She could whittle before she could walk. When she was still a child, she could carve a rose that strangers would stop to smell, a dragonfly that trout would rise to strike. In Kate’s little town of Samilae, people thought that there was magic in a knife. A person who could wield a knife well was, in their eyes, half-way to a witch. So Plain Kate was very small the first time someone spat at her and crooked their fingers. Her father sat her down and spoke to her with great seriousness. “You are not a witch, Katerina. There is magic in the world, and some of it is wholesome, and some of it is not, but it is a thing that is in the blood, and it is not in yours. “I will never give it up,” she answered. And he laughed and called her his Brave Star, and taught her to carve even better. They were busy. Everyone in that country, no matter how poor, wore a talisman called an objarka, and those who could hung larger objarkas on horse stalls and door posts and above their marriage beds. No lintel was uncarved in that place, and walls bore saints in niches, and roads were marked with little shrines on posts, which housed sometimes saints, and sometimes older, stranger things. Plain Kate’s father was even given the honor of replacing Samilae’s wiezi, the great column at the center of the market that showed the town’s angels and coats of arms, and, at the top, supported the carved wooden roof that sheltered the carved wooden gods. The new wiezi was such a good work that the Guild Masters sent a man from Lov to see it. The man made Kate’s father a full master on the spot. “My daughter did some of the angels,” he told the man, gathering Kate up and pulling her forward. The man looked up at the faces that were so beautiful they seemed sad, the wings that looked both soft and strong, like the wings of swans that could kill a man with one blow. “Apprentice her,” he said. But what happened was that her father died. I don’t want to read much further because this and Reckless were my BEA best snags. I will come back to read past the first couple of paragraphs later. Ana, I find myslef in the expectation scenario more than I like lately. I often wonder if I need to really start to reign my expectations in because so many really good books suffer at the expense of what may be my high and maybe unreasonable expectations. But then, I think, I expect what I expect how is it my fault that the book doesn’t live up. It’s such a difficult thing to navigate. The story of a girl who loses her father and is imperiled by suspicions that she is a witch, Levine said Bow’s prose has the “lyrical strength and classic proportions” of master writers. “She is a truly original talent,” Levine said, evidenced by a “breathless e-mail” he got from an associate at the most recent London Book Fair who said Printz Award winner Meg Rosoff had read Plain Kate and couldn’t stop raving about it. Rosoff’s blurb – “anything but plain, full of poetry, magic, sorrow and joy” – will be on the cover. *Arthur A. Levine, editor of Plain Kate at Book Expo American 2010, NYC, 2010. I read Plain Kate and think that Levine nailed it! PK deserves five stars and I am looking forward to see it shortlisted for YA books this year. Katerina Svetlana? I’m a bit confused. Both are Russian names, but we don’t have such double names in Russia. Is the book set in Russia or just in a place inspired by Russia?